Marvel does it again! And perhaps better than ever! I loved Black Panther, unconditionally. I’ve been super excited about this film and it delivered everything I could have hoped for. Sometimes I’ll have some quiet reservations about a Marvel movie, but not this time. Black Panther is superb! One of Marvel’s absolute best! Movie Rating: 10/10 – Fantastic. I feel a little sorry for anybody decrying superhero fatigue. As a lifelong comic book fan, especially Marvel Comics, I have been living childhood dreams for more than a decade now. We’re 10 years deep into Marvel churning out superhero movies and they are still making films as amazing as Black Panther. Somebody pinch me! Join me after the jump for my thoughts and a review of Black Panther. There will be FULL SPOILERS for the film. Please feel free to share your own thoughts in the comments! The one word I keep coming back to for Black Panther is ‘confident’. Everything this movie did, from dialogue to jokes to action scenes to character motivations to song choices, was done with purpose and style. Nothing in this movie seemed wasted or just thrown off to fulfill obligatory movie requirements. One of the first action scene in the movie, when T’Challa faces off against M’Baku for the throne, I just kept thinking not only how well the fight was staged and filmed, but just how key it was to the story and how well it established world-building. Or in the final battle, when a defeated W’Kabi looks around and sees that, within a day of Killmonger taking the throne, Wakandans are fighting Wakandans. It didn’t need to be said or spelled out for the audience. The impact and the meaning was clear. Black Panther is a well-built movie and probably the best of all the Marvel solo superhero movies. Maybe not as good as the original Iron Man, but I might be looking back on that movie with rose-colored glasses. Black Panther clearly represents the peak of the form, regardless. 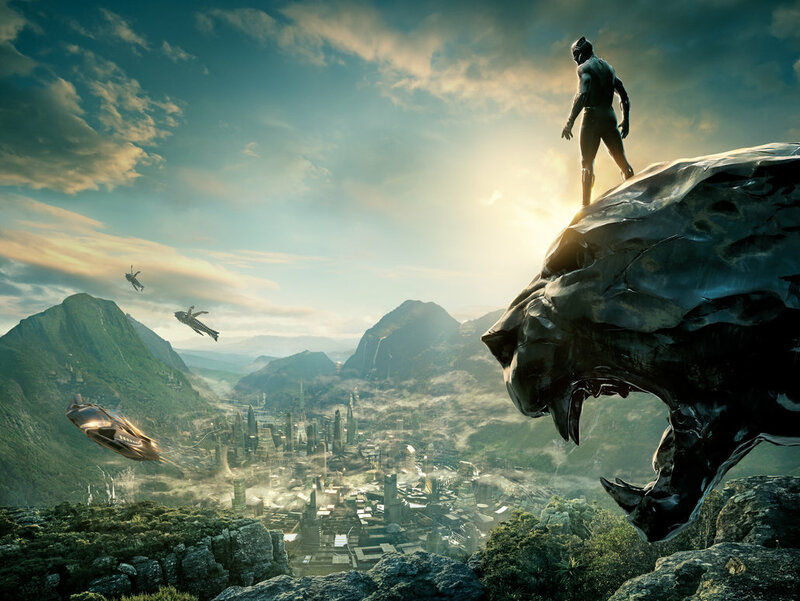 It gives Black Panther’s origin a wholly unique story, what with the ascension to the throne, and it tells that story with a perfect supporting cast and stakes. Everybody was great in Black Panther. Bar none. 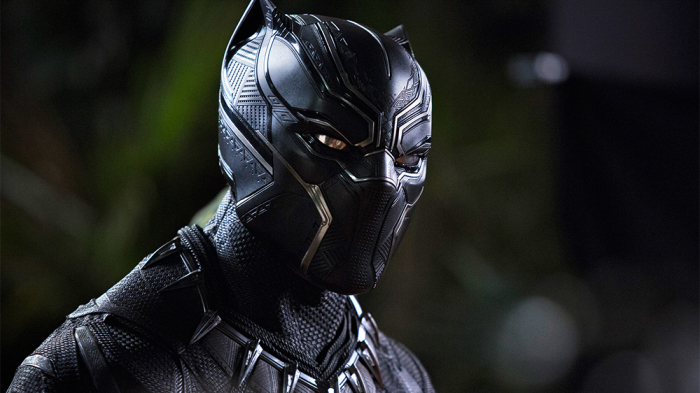 Chadwick Boseman is phenomenal as T’Challa, with a steady, regal demeanor covering a gentle underbelly. He’s soft when he needs to be, and with the people he needs, but he’s as iron-willed as superheroes come. And the Black Panther suit is darn cool. Then everybody around him is just as amazing in their own roles. Lupita Nyong’o is a solid hero in her own right, and a great love interest who doesn’t just wilt to the side. Awesome. 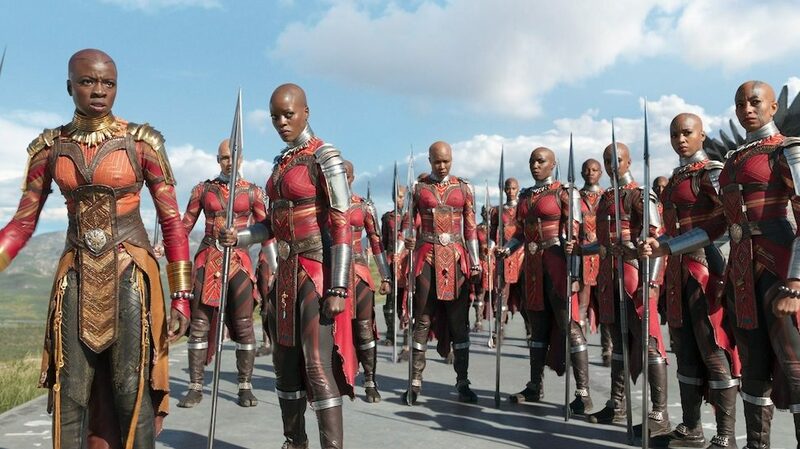 Danai Gurira is perfect as the general, and the whole Dora Milaje is so damn cool! When they all turn on Killmonger in the final fight, their precision is a thing of art! Letita Wright is hilarious and charming as Shuri, despite her use of annoying, outdated memes. I assume Wakanda has access to the internet, but I can understand that she’s a little behind. I liked Daniel Kaluuya as the conflicted but determined W’Kabi. Martin Freeman was a nice addition as the American fish-out-of-water. I loved that moment in the final battle where he weighed the risks to his own life and went back into the ship to carry out his mission. And Andy Serkis was phenomenal as Klaue! Holy cow! Why’d they have to kill him? He was freakin’ hilarious and full of more personality than half the characters in the MCU. Even the way he carries himself is bursting with creative energy for a wildly fun character. The cast for Black Panther was spot on! As great as everybody was, I think M’Baku, the Man-Ape, was my favorite character. He was never called “Man-Ape” in the movie, but he’s based on the comic book villain. 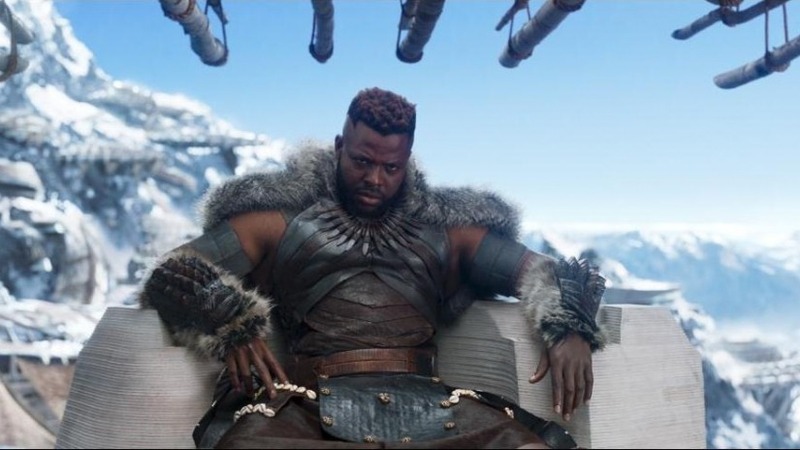 Played by actor Winston Duke, M’Baku was a friendly antagonist, and I love those. Plus he was pretty darn hilarious. I just liked the idea of the exiled fifth tribe and their tense alliance under the Wakandan umbrella. I liked that the Queen Mother and her crew turned to them for help when Killmonger took over, bringing to life that whole ‘the enemy of my enemy is my friend’ idea. I loved how they offered M’Baku the super flower, but rather than take it for himself, he revealed that he had T’Challa. I loved how his reasons for not fighting made sense, and also how we clearly knew he was going to join the fight anyway. And I especially enjoyed that scene in the end, where T’Challa enters his throne room and we see M’Baku on the council. I thought for sure we’d get a little scene where the movie actually addresses that W’Kabi is out and M’Baku is in, but like I said before about confidence, the movie didn’t need to spell it out for us. We could see the red robes of the other tribe had taken over border security, and we could see that M’Baku was on the council now. That was enough and it was awesome. I’m rather pleased that M’Baku will return in Avengers: Infinity War! Who knew Man-Ape could be so cool after all? 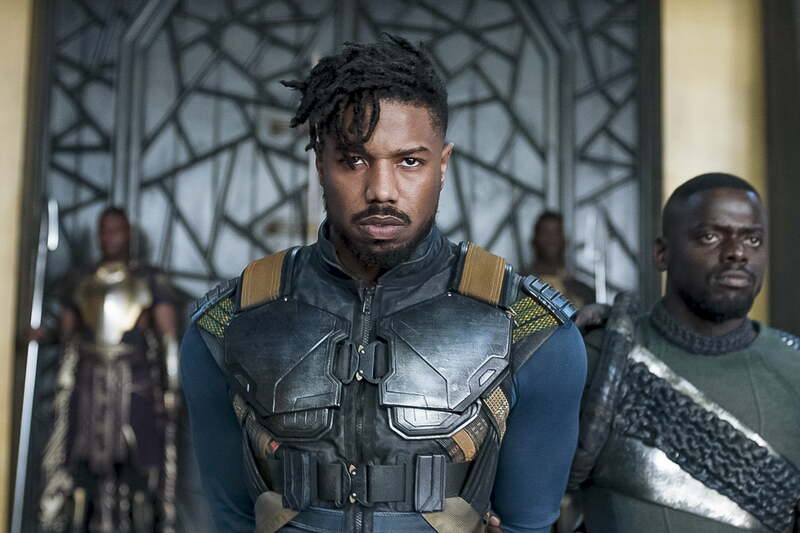 Everybody is praising Michael B. Jordan for his role as Erik Killmonger, and I agree, he should be lauded. But I could have used more of him to really get his importance across. During the chase scene in South Korea, I remember thinking that we hadn’t even gotten to whatever Killmonger is going to do in the movie, so clearly there’s a lot more movie to go. But then I was let down with how little Killmonger appears in the film. He has a hugely important role, and I agree that, as a villain, he’s not only got great motivation and a great plan, but I could have used more time fleshing him out. Did he have any redeeming qualities as a person? Or as a king? Maybe put in more time to Killmonger reacting to the city or its people. We kept seeing great shots of that dusty marketplace and all the average Wakandan citizens. How did they feel that a usurper had suddenly taken the throne? How does Killmonger feel as he strolls through that marketplace? Such a great job was done establishing the breadth of Wakanda and its traditions, but once Killmonger abused them to enact his plan, he just moved right on to his plan. Granted, his plan was a pretty badass version of trying to take over the world. And Killmonger never faltered in his strength and anger. His final words were as strong as anything any Marvel villain has ever said. I almost teared up as he watched that sunset. I am a straight, white, cisgender male, so I don’t really have any standing with which to discuss race and Black Panther. There are many better writers than me on the internet who are taking care of that. I wouldn’t even know where to begin. But I did want to remark on the idea that I am loving the discussion on the importance of representation in media, and how Black Panther is such a huge positive example. Please forgive me in advance for any inelegance in writing this entry. Again, I am a straight, white, cisgender male, and I grew up in a pretty homogenous area in upstate New York. It wasn’t until college that I was finally exposed to different people, cultures, religions and pretty much everything else. I am eternally grateful and probably can’t even begin to appreciate how lucky I was that I did not grow up in a racist or prejudiced community. I never encountered it at school or anywhere in public. My family doesn’t appear to have a racist bone in its body. I don’t even have that drunk uncle who ruins Thanksgiving with his racist rants. I know several admitted Republicans, but thankfully they’re not the super bigoted kind, at least not around me. The few minority students we did have in school were treated, as far as I knew, as just regular people. I say all of this to establish that the white privilege is strong with me, and that I had no idea it was even happening as I grew up. I’m trying to be better now as an adult. And part of that, I think, is trying to appreciate how important representation is through Black Panther. A film starring a black superhero, with a mostly black cast and production team, with a strong focus on African culture and the importance of being black in the world, coming out during Black History Month, is astoundingly cool and it matters to black people. And I like reading responses as to how that’s important. I like reading about people raising money to take underprivileged black youths to this movie. I love reading about black people getting excited to have this representation. It helps me to better understand people who are different from me. I think that sums up my feelings nicely, in ways I’m probably not very good at explaining. 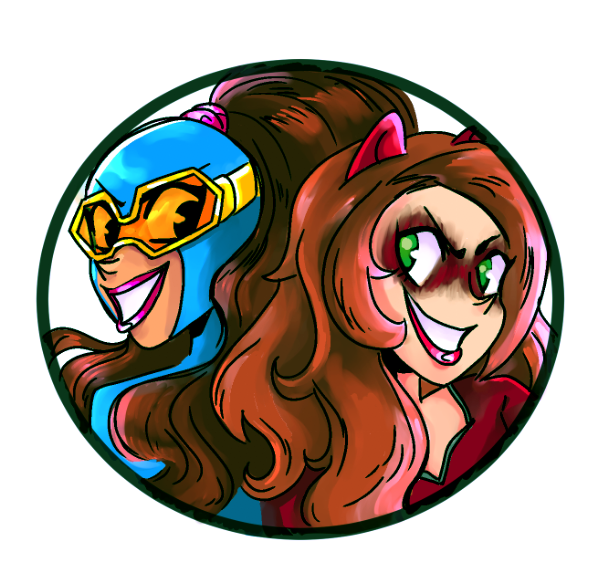 But I wanted to get it out there that I’m excited for everyone embracing representation and I hope we see a lot more of it going forward. 1. Hopefully Black Panther 2 is at the top of Marvel’s Phase 4 plans! Followed by Spider-Man 2, Doctor Strange 2, Black Widow, Captain Marvel 2, Fantastic Four and X-Men! Marvel has been mum on their Phase 4 plans, and for good reason! We’ve still got to get through two Avengers movies, Captain Marvel and the Ant-Man sequel. Why list off a bunch of other upcoming movies when they can focus all their effort into getting us excited for their current movie slate? Makes sense to me! No doubt they have a lot of movies planned, with a lot of sequels. And hopefully Black Panther 2 is now at the top of their plans! An opening weekend haul that rivals the Avengers movies? That money has got to sing! I want Ryan Coogler back directing. I want as many of the cast back as they can manage. I want more Black Panther! I want a proper sequel that builds on the greatness of the original and delivers an even bigger and better movie! Posted on February 21, 2018, in Avengers, Lists of Six!, Marvel, Movies, Reviews and tagged Black Panther. Bookmark the permalink. 2 Comments.